The Christmas price for Lundix SPC Bridge Homey is only 155 Euro (1595 SEK) incl VAT excl shipping. Normal price is 195 Euro (1995 SEK). The offer is valid until 31 December 2018. For more information please see www.lundix.se/smarta-losningar. For questions or orders please send a mail to info@lundix.se. 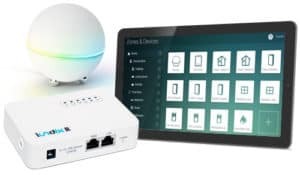 SPC SmartBox is a network device that adds smart Home and Building Automation features to Vanderbilt SPC Intrusion Detection System. SPC SmartBox can read status from and control outputs and actuators in SPC, Z-Wave, KNX and MODBUS devices. For instance, an alarm area mode change or a alarm input status change can be used as scene trigger to control Z-Wave/KNX light switches or a water valves. SPC SmartBox hardware is based on the Z-Wave Gateway iCPE from CTS Northern Europe. Only IP network communication is required between the SmartBox and the SPC system (Vanderbilt official FlexC IP protocol is used). More features will be added in the future, e.g. media support. Alarm and event notifications via email, NMA (Android) and Prowl (iOS). SPC Web Gateway is a software application providing a generic open interface to Vanderbilt SPC panels. The interface will simplify SPC integration with third party applications and products such as Home and Building Automation Systems. Supported protocols are REST API for queries/commands and Websockets for event reports.